Need a stunning postcard design? Our design team can help! 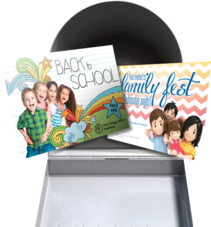 We specialize in crafting highly effective eye catching postcard designs. Full color printed on front and back, on thick 14pt card stock, with free UV coating options. Basically, we make your postcard look good! Prepared and mailed for less than the cost of a postage stamp! We do it all in-house. Saving money and time using our mail services. Growing your business doesn't have to be such a challenge. We have helped over 60,000 businesses reach more customers, and we would love to do the same for you! Get Your Free EDDM Quote! Choose from our beautiful, customizable templates or have our in-house design team create a postcard tailored to your business.